Bengaluru, February 20: The Karnataka Police on Wednesday arrested Congress MLA JN Ganesh from Gujarat for allegedly assaulting another lawmaker of his party during a brawl at a resort. Ganesh was absconding for almost a month and was arrested by the police after a tip about the leader from Bellari. 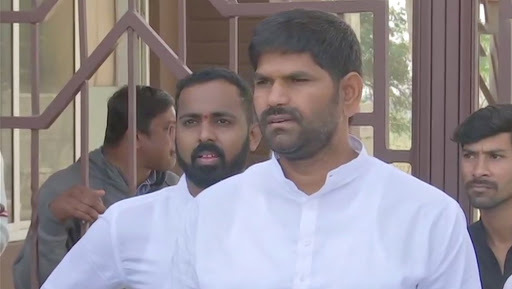 Confirming the arrest of the Ganesh, Karnataka Home Minister MB Patil said, as reported by News 18, that the Bellari MLA was arrested in Gujarat at 2 pm on Wednesday and would be brought back to Bengaluru later in the day. Adding more, he said, “He would be produced before Ramnagar court on Thursday.” Even his arrest was confirmed by Inspector General of police of the Central Range B Dayananda. Karnataka CM HD Kumaraswamy Clarifies After Alleged Anti-India Remarks on Pulwama Attack. It is to be known that Ganesh went absconding after a brawl with another Congress lawmaker – Anand Singh – on January 20, while they were at the Eagleton Resort on the city outskirts. The Congress party had sequestered all its MLAs to prevent from a poaching bid by the Bharatiya Janata Party to destabilise the ruling dispensation in Karnataka. According to reports, before the arrest, a team of 18 police officers had looked for Ganesh in Mumbai, Goa, Ballari and Hyderabad. In the FIR, it is mentioned that Ganesh had allegedly attacked Singh with his fist and a flowerpot, him near his eye and kicked on his chest. Due to which, Singh was hospitalised. Later, an attempt to murder case was registered against his name and Ganesh flew from the spot. He even didn’t appear for the Budget Session, despite a whip.